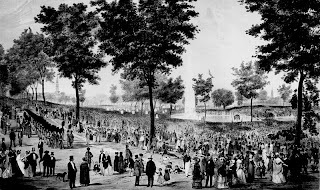 This gray memorial plaque outlines the history of Boston Common, the large green lung located in the middle of Boston. 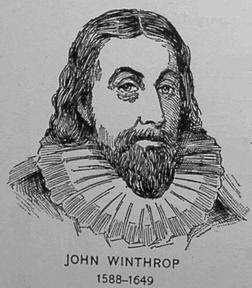 John Winthrop was born in 1587 in Edwardstone, Suffolk, and he, his third wife Margaret Tyndal, their three sons and eight servants left their small manor bound for the new world 1630-1631. Here he became the governor of Massachusetts Bay Colony. 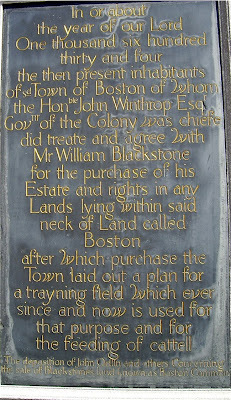 In or about the year of our Lord One thousand Six hundred thirty and four he bought what was supposed to become Boston Common from William Blaxton, born 1595 in County Durham, and arrived at Weymouth MA in 1623. In 1625 he settled as the first inhabitant of Boston. His house was located at todays Beacon Street. Later he settled near Cumberland, Rhode Island. He died as a very old man in 1675. So when you walk through the park today you can think back on the contract signed in 1634, and two puritans role in creating an American city. It is not true that America has no history, as many Europeans tend to believe. Travel to Boston and feel it! !